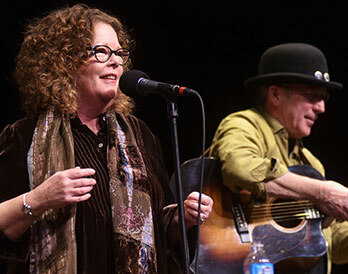 For three decades Grammy winner Mollie O’Brien and her husband, guitarist Rich Moore, have made it their mission to find, mine and reinvent other artists songs. As songwriters they add their own tunes to the canon of American roots music, boasting a fluid ability to make themselves at home in any genre. Rich, known for his hilarious onstage banter, is a powerhouse guitar player who can keep up with O’Brien’s twists and turns: from blues to traditional folk to jazz to rock and roll. They met in 1981 at the Denver Folklore Center on April Fools Day. Mollie was singing with the vintage swing outfit Prosperity Jazz Band, and Rich was playing bass with The Late Show, a rock-steady blues outfit. Within a year Mollie joined The Late Show, and they began playing Colorado blues festivals and concerts. In the late 80s, Mollie earned fame when she and her brother Tim released three critically-acclaimed albums for Sugar Hill Records (Take Me Back, Remember Me and Away Out On The Mountain). Eventually, Mollie recorded five equally well-received solo albums and was a regular on Prairie Home Companion. Meanwhile Rich stayed at home with the kids and performed locally while Mollie and Tim toured. Recent years have seen a renewed focus on wife-husband duet recordings and tours. Their latest is the exquisite Daughters (2015).